Yale UK has won Consumer Product of the Year for its Conexis L1 Smart Door Lock at the National Technology Awards. Beating off stiff competition from Parcelly, The Bank of Ireland and Boosty, it was Yale’s Conexis L1 Smart Door Lock that triumphed. Hosted by comedian Holly Walsh, the sold-out ceremony brought the technology sector to the forefront, celebrating the pioneers of innovation and helping to encourage excellence within the industry. Each award was voted for by an independent panel of judges. Stephen Roberts, Marketing Manager for Yale, said: “We’re delighted to have won Consumer Product of the Year. It is an exciting time for Yale as we cement our move into the smart technology industry, and it’s fantastic to receive recognition for all the continued hard work we have put into developing products that meet a real consumer need. The Conexis L1 Smart Door Lock puts users fully in control of their door, allowing them to configure, control and unlock their front door all from their smartphone, via a Bluetooth low energy App. For ultimate peace of mind, homeowners can create and send mobile keys to family and friends, and keep track of who comes and goes simply using their smartphone. 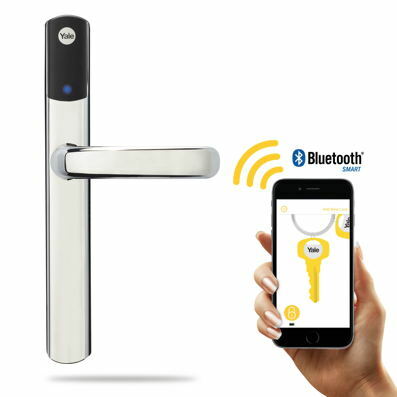 Thanks to the new Twist and Go functionality, users can also twist their smartphone 90 degrees to unlock the front door, as well as having the choice of key tag, key card or phone tag, depending on preference.